Rena Lesué: SLC Comic Con: an amalgam of nerds, cosplay, and girlish squeals. SLC Comic Con: an amalgam of nerds, cosplay, and girlish squeals. Among other things, my bucket list includes working on a project with Joss Whedon, having a NY Times bestseller, seeing/meeting an actor from Buffy in real life, and attending a comic con. As of this weekend, I can scratch two of those things off my list. I attended the first ever SLC Comic Con this weekend! Hizzah! A guy dressed in a zombie chased us down while trying to get this photo. She's so sweet in real life. I didn't see her shoes, but I assume they were fierce just like in Buffy. 3. 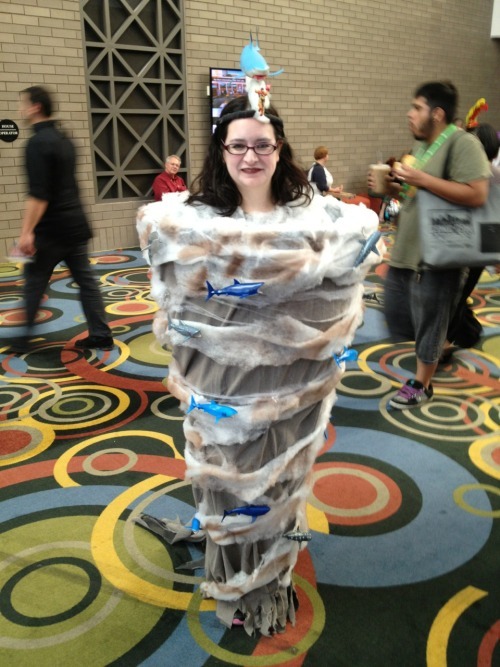 Someone came dressed as Sharknado. Seriously, I found my people. Here's the link to her pic. Layne is dressed as Violet Baudelaire. Cole went as Ripper from Buffy, and I'm the 10th doctor. 5. Watching a Power Ranger do a flip over 7 audience members. 6. Gavin thinking Comic Con was his own personal parade. He waved like Miss America to everyone he passed. He said "Hello" to every other Batman and villain. Some wanted to get a picture with him, and one Poison Ivy asked him for his autograph. =) People are cool. 1. Waiting in line for an hour to get in and missing the Aquabats because of it. 2. There were so many people, it was worse than the Color Festival. I couldn't let go of the kids hands or they'd disappear. Someone working concessions said they kept count, and on Saturday 51 children lost their moms. Scary. The fire marshall threatened to shut Comic Con down. They had to stop letting people for ten minutes at a time, giving time for people to leave before they added more. Seems like poor planning, however, I think the organizers underestimated the sheer volume of nerds in our community. Next year will be better. This is actually a pretty tame moment. Not too crowded. We could breathe for a sec. Who you gonna call? Violet Baudelaire, Ghostbusters, or Batman? 3. Food prices were astronomical! $16 for a salad, bagel, and two snack bags of chips. 4. I only saw two workshops. I wanted to go to two other ones, but I had my kids with me and I didn't want them to be bored. I don't think I'll bring them next time, but Layne is already planning her costume for 2014. Maybe I'll get the three-day pass and take her for one day and go by myself or with Cole on the other days. 5. I didn't see anyone dressed as The Bloggess.